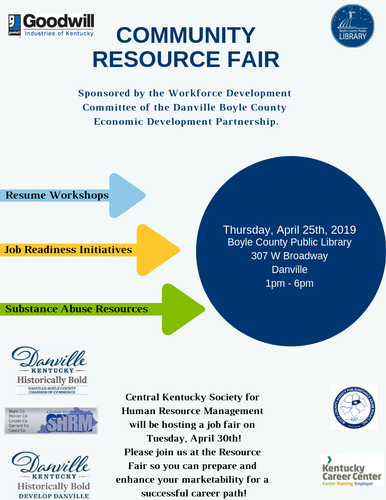 You are invited to participate in the Resource Fair on April 25 sponsored by the Workforce Development Committee of the Danville-Boyle County Economic Development Partnership (EDP). You may have read articles in the Advocate Messenger or on social media highlighting the committee's efforts to identify local agencies that assist individuals in overcoming barriers to finding or retaining employment. Many job seekers in the community are unaware of the services provided by local agencies that can assist them in preparing for a job or career path. The objective of the Resource Fair is to highlight and market existing programs that directly contribute to increasing our talent pipeline - and help our local job seekers connect with the assistance they need. Note: the local Central Kentucky SHRM chapter will host a Regional Hiring Event the week following the Resource Fair featuring employers that are currently hiring for open positions. Tentative plans are to also offer resume workshops, substance abuse resources, job ready initiatives, and other services for those in attendance on April 25. Will you join us for free marketing for your agency and increased awareness of program services? SPACE will be limited so reserve your spot now. Deadline to RSVP is Monday, April 1st, 2019.